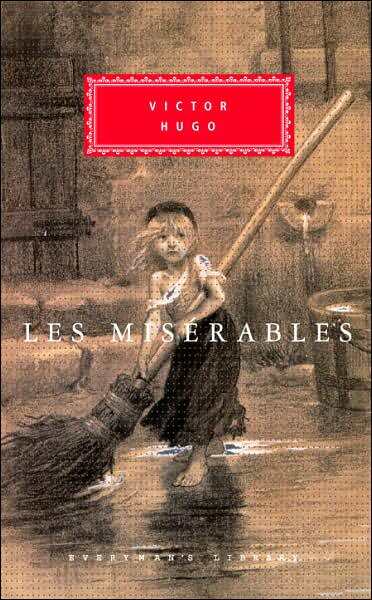 Les Miserables is one of the greatest classics in French Literature. Written in the nineteenth century by Victor Hugo, it covers many of the highs and lows of the time, its instability and the miseries of the lower stratum. The time period in the novel covers the aftermath of the French Revolution and Napolean's rule. With a violent history behind it, and more bloodshed yet to come, Victor Hugo shows through one man, the shaping of a whole new society. Jean Valjean, a young peasant condemned to 19 years in prison, finds his mind broadening after meeting Bishop Myriel despite the years of ignorance that have warped it. Faced with honesty and goodness, he is forced to review his life and begins the journey towards greatness. Where one man who has never known the light, fights against generations of darkness, others will soon follow. Jean Valjean goes through struggle after struggle in Victor Hugo's stupendous novel, finds himself thrown back, yet perseveres against all odds. At times, the length of the novel and the long pages of history and architectural lessons forced me to skip (a lot!) of the sections, but I found the story pulling me through it all. It was amazing to read how Jean Valjean faced life, how he, an uneducated peasant with nothing except his two hands, educated and broadened his mind, his knowledge and his wisdom - not only for himself, but for others. There were set backs which made it only all the more real. This was no easy walk in the park, but a struggle against his darker self and that of others. It took great courage and strength to become the man he at last becomes. Now I hear that the novel is being turned into a film starring Hugh Jackman as the famous hero Jean Valjean, Russel Crowe as his main antagonist Javert, Anne Hathaway as Fantine, and Amanda Seyfried as Cosette. I look forward to watching it!